On this page you will find numerous resources including support groups, free downloadable resources, a treatment locator, videos, recommended books, helpful websites, and inspirational images to share on your social channels. *The information contained on this page is drawn from highly reputable sources; however each website is independently operated and we cannot fully endorse everything contained on each site but we hope the information will be useful. 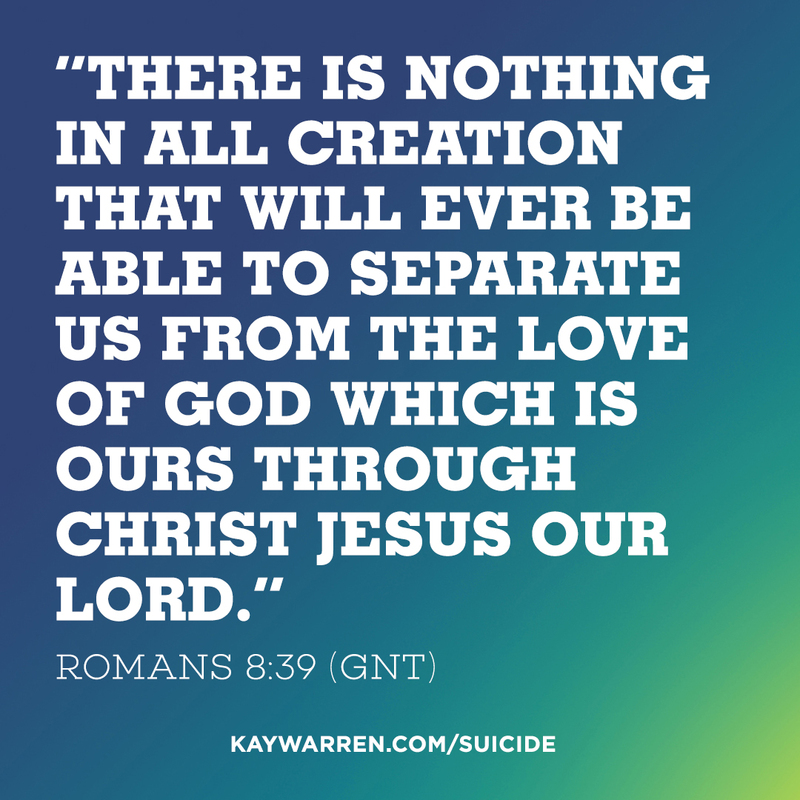 What does God's Word say about suicide? Click on the link below to read a note from Pastor Tom Holladay. 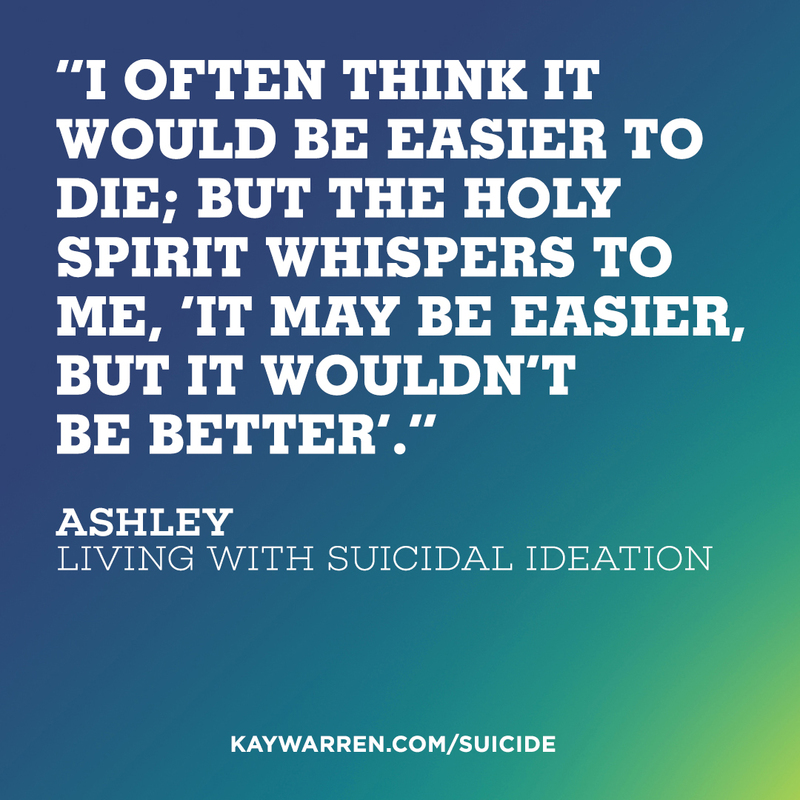 Click on the link below to find ten helpful tips to help you navigate conversations with suicide loss survivors in a kind, thoughtful, and responsible way. To download a printable version, click HERE. Click on the images below to view and download these free resources. Aevidum, meaning "I've got your back," is an organization inspiring elementary, middle and high schools, and colleges to shatter the silence surrounding depression and suicide and adopt cultures of care and advocacy. They also have a free three-hour suicide prevention training curriculum for high school students. 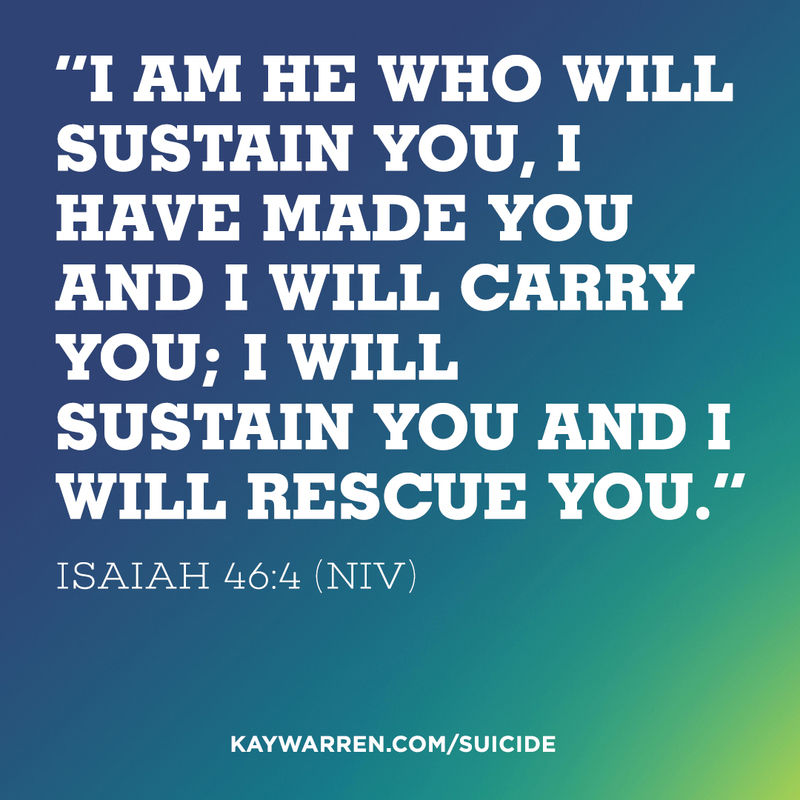 The Alliance of Hope for Suicide Loss Suvivors, a charitable nonprofit, provides healing support for people who have lost loved ones to suicide. 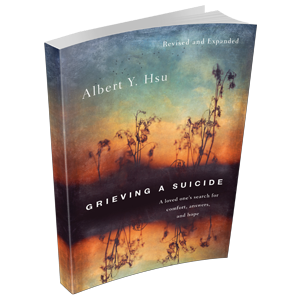 The mission of the American Association of Suicidology (AAS) is to promote the understanding and prevention of suicide and support those who have been affected by it. The AAS provides resources such as a list of crisis centers and attempt survivors support groups. 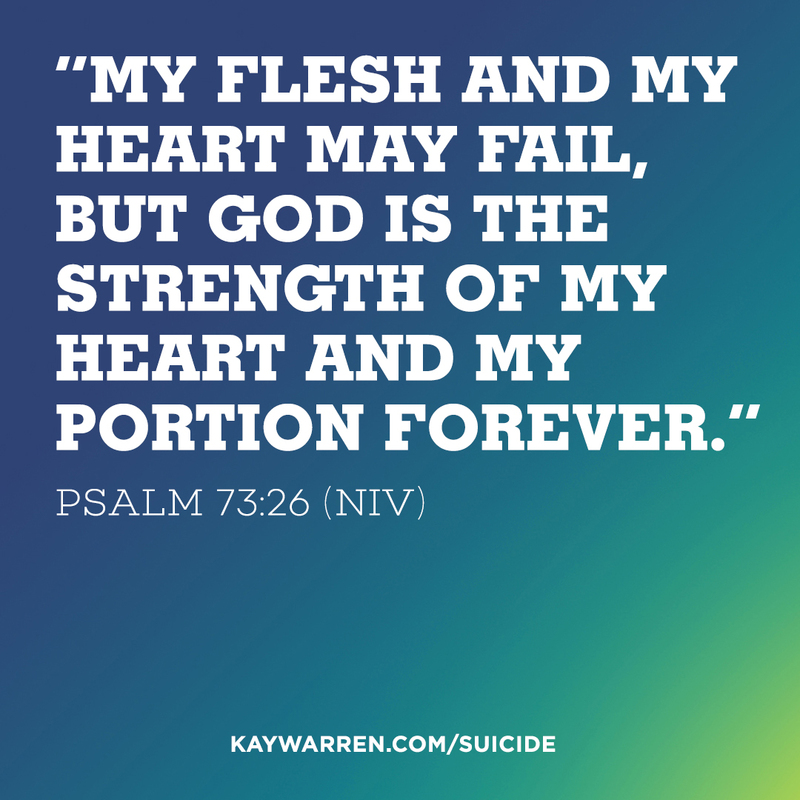 The American Foundation for Suicide Prevention (AFSP) provides resources, support, and advocacy for suicide prevention. AFSP supports regional chapters, school programs, and online screenings. They also have school programs and online screenings. Befrienders Worldwide uses volunteers to provide emotional support to prevent suicide via telephone helplines, SMS messaging, face to face, internet chat, outreach and local partnerships all around the world. They have a helpline finder by country and their website page is available in 21 languages. This campaign is an advocacy coalition of citizens, nonprofit leaders, and leaders from the private sector who have come together to change the culture in America about mental health, mental illness, and wellness. They teach people to learn the five signs of emotional suffering. The Canadian Association for Suicide Prevention is developing a Canadian national strategy for suicide prevention. They also provide educational material and resources. The Centers for Disease Control (CDC) webpage provides information and resources on suicide prevention. 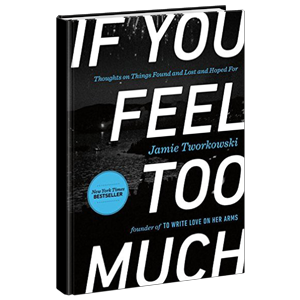 This guide was designed to offer hope and help for people who are experiencing suicidal thoughts, as well as to the friends and family who want so badly to help them. Communities Healing Adolescent Depression and Suicide (CHADS) saves lives by advancing the awareness and prevention of depression and suicide. CHADS offers school outreach programs, community awareness presentations and classes, as well as family support programs. Choose Life is Scotland’s national strategy and action plan to prevent suicide. Clinical Tools, Inc. has developed suicide prevention trainings for professionals and educators. The construction industry has the highest number of suicides. The goal of the Construction Industry Alliance for Suicide Prevention is to provide and disseminate information and resources for suicide prevention and mental health promotion in construction. The mission of the Dave Nee Foundation is to eliminate the stigma associated with depression and suicide among adolescents and young adults. Their Uncommon Counsel program raises awareness and provides information and resources about depression and suicide to law students and attorneys. The Defense Suicide Prevention Office (DSPO) provides advocacy, program oversight, and policy for Department of Defense (DoD) suicide prevention, intervention and postvention efforts to reduce suicidal behaviors in Service members, civilians and their families. The DoD Dedicated Peer Support Call and Outreach Center is available to all Service members across the Department and their families via 24/7 through chat, email, phone and text. Follow-up Matters is a project of the National Suicide Prevention Lifeline. It seeks to advocate for emergency departments to provide follow-up care after a mental health crisis and for the partnership of Lifeline networks to help provide that follow-up care. The Glendon Association’s mission is to save lives and enhance mental health by addressing the social problems of suicide, child abuse, violence, and troubled interpersonal relationships. They have created the Violence and Suicide Prevention Alliance - A collaboration of individuals and organizations to confront violence and suicide. They also provide research, workshops, publications, documentaries and CE and eCourses. This website provides information and resources on suicide prevention for Army National Guard Soldiers and their family members. Half of Us, a project of the Jed Foundation, provides information for young adults on suicide prevention. Means Matter seeks to give information on guns and the importance of “means reduction” as a comprehensive approach to suicide prevention. HelpPRO gives people struggling with a suicide crisis an opportunity to link to mental health service providers with expertise in suicide risk assessment, management, and support. IMAlive is a worldwide, live online network that uses instant messaging to respond to people in crisis. 100% of it's volunteers are trained and certified in crisis intervention. IMAlive was created in part by the Kristin Brooks Hope Center which runs the 24-hour hotline numbers 1-800-Suicide (784-2433) and 1-800-442-HOPE (4673). The Center also offers Alive! Mental Health Fair for college campuses - an interactive and education suicide prevention program. The Indian Health Service gives resources for suicide prevention in American Indian and Native American communities. The International Association for Suicide Prevention (IASP) collaborates in 50 countries and with the World Health Organization on suicide prevention programs and resources. The IASP is dedicated to preventing suicidal behavior, alleviating its effects, and providing a forum for academics, mental health professionals, crisis workers, volunteers, and suicide survivors. They provide tools to find a crisis center anywhere in the world. The Jason Foundation, Inc. (JFI) is dedicated to the prevention of the “Silent Epidemic” of youth suicide through education to help identify and assist at-risk youth. This is accomplished through curriculums and seminars for educations, law enforcement personnel, health professionals, students, parents and faith communities. Their Coaches Assistance Program (C.A.P.) gives suicide prevention resources specifically for coaches. The Jed Foundation (JED) is a national nonprofit that exists to protect emotional health and prevent suicides by partnering with high schools and colleges to strengthen their mental health, substance abuse and suicide prevention programs, equipping teens and young adults to help themselves and each other, and encouraging community awareness. They also have resources for parents, including online tools and advice. Know the Signs is an interactive suicide awareness website, also available in Español. Law Lifeline is an online resource for law school mental health and suicide prevention. Life in Mind connects Australian suicide prevention services and programs to each other and the community by providing a digital platform for knowledge exchange around suicide prevention activities in Australia. Lifeline provides resources for attempt survivors, clinicians, family, and friends along with a therapist and support group finder. LivingWorks Education is a community suicide intervention training company. They offer four intervention trainings: Applied Suicide Intervention Skills Training (ASIST), safeTALK, suicideTALK (also available online as esuicideTALK), as well as Suicide to Hope for clinicians and other professionals. 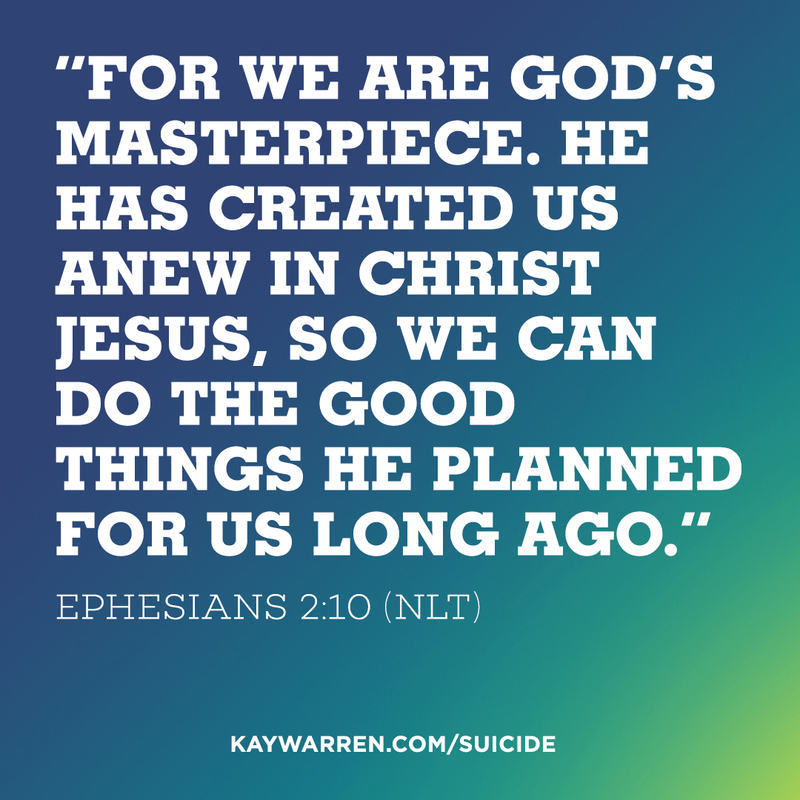 The Lutheran Suicide Prevention Ministry is an Independent Lutheran Organization working collaboratively to implement suicide prevention policies approved by the ELCA. It is powered by volunteers and focuses on awareness, education, collaboration, and advocacy. The Mayo Clinic gives information about suicide and suicidal thoughts, including videos. The National Action Alliance for Suicide Prevention is the public-private partnership advancing the National Strategy for Suicide Prevention. In addition, they provide services including including resources specifically for the workplace, construction industry, law enforcement, the mental health system, faith communities, firefighters, American Indian and Native American communities, as well as public suicide messaging. The National Association of School Psychologists: Preventing Youth Suicide gives information for educators and students about suicide prevention. 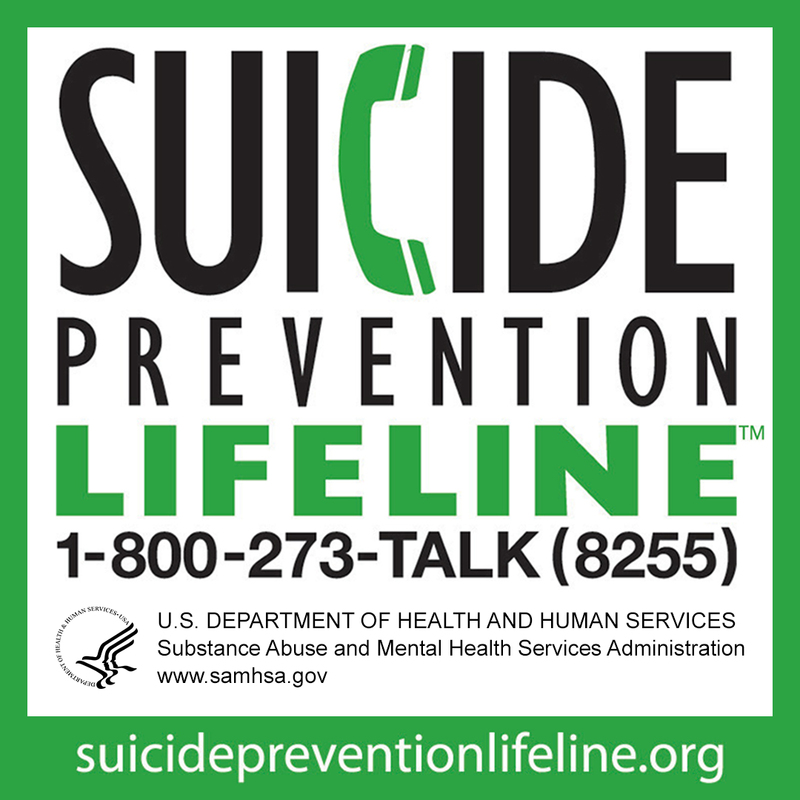 A program of the American Association of Suicidology, the National Center for the Prevention of Youth Suicide believes suicide can often be prevented and offers resources that promote effective services, strong communities, safe schools, and supportive families to help the development of healthy youth. The National Center on Institutions and Alternatives: Suicide Prevention in Custody provides information on suicide prevention and liability reduction services to local and state correctional agencies. This includes policy assessment and development, staff training, and expert witness consultation. The National Organization for People of Color Against Suicide (NOPCAS) is a volunteer organization that serves to address the issue of suicide prevention and intervention in communities of color. They offer support services, training materials, manuals, videos and DVDs for collaborating communities. 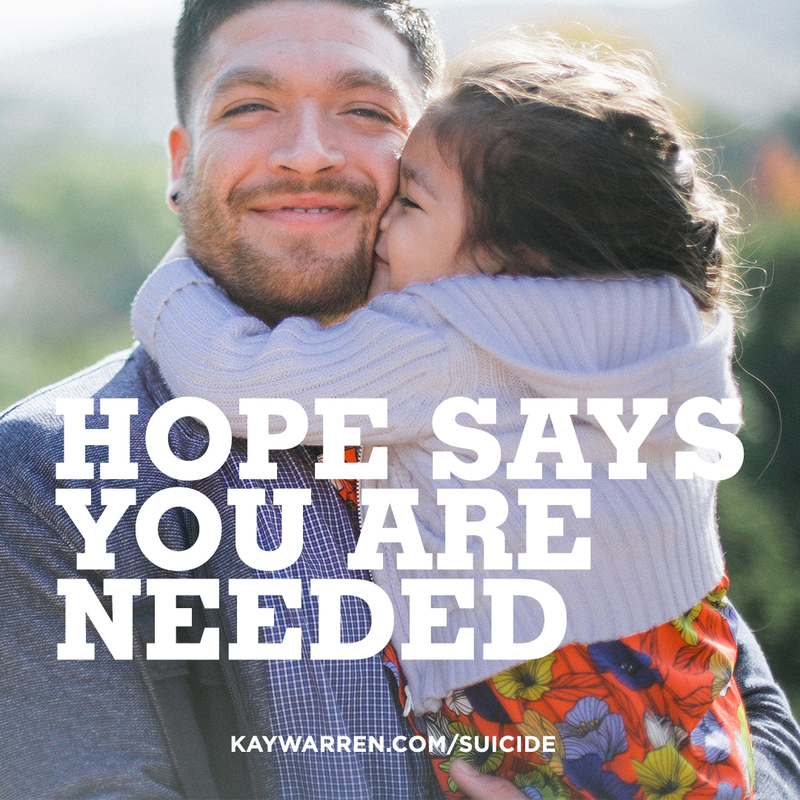 The National Suicide Prevention Hotline is available at 1-800-273-TALK (8255) and connects callers to a skilled, trained counselor at a crisis center in their area, anytime 24/7. Through their website they also provide 24/7 services through Lifeline Crisis Chat and Safe Space - calming, de-stressing videos. Now Matters Now gives video content and stories for skills and support to reduce suicidal thoughts including mindfulness, opposite action and caring messages.These skills are part of Dialectical Behavior Therapy. The QPR Institute offers a 1-hour training to learn how to recognize the warning signs of a suicide crisis and how to question, persuade, and refer someone to help. The QPR Institute also created a QPR Online Gatekeeper Training and QPR for Veterans. Supporting a student who struggles with mental health issues can be difficult for parents and they may not know where to begin to offer help. This guide provides resources and expert advice to help parents compassionately care for high school and college students to make sure they get the professional services they need. This website gives information and training on the Safety Planning Intervention – a written, prioritized list of coping strategies to provide people experiencing suicidal ideation with a specific set of concrete strategies to use in order to decrease the risk of suicidal behavior. The plan is a collaborative effort between a treatment provider and a patient. Samaritans runs a 24/7 free hotline for those in the UK and Republic of Ireland. Contact can be made via phone call, email, mail or at one of the 201 local Samaritan branches. They also support schools, college communities and other youth settings with a free online teaching resources (DEAL), talks given by volunteers, and support for implementation of a post-vention response (Step by Step). Samaritans USA is the coalition of the 11 Samaritans suicide prevention centers in the United States. Volunteers and professional staff reduce violent, self-destructive and suicidal behavior by providing support to people in distress and educating caregivers and health providers about how they can be most effective in responding to people in crisis. Their 24-hour crisis hotline, crisis centers, suicide survivor support groups, public education, awareness and community outreach programs. The Substance Abuse and Mental Health Services Agency SAMHSA provides information and resources for mental health and substance abuse. SAMHSA also created the Suicide Safe App for mental health providers to integrate suicide prevention strategies into practice. 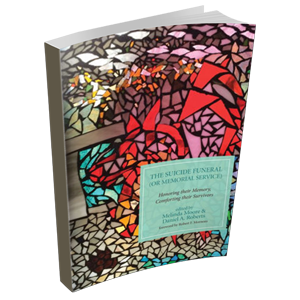 They also offer A Journey Toward Health and Hope: Your Handbook for Recovery After a Suicide Attempt. Suicide Awareness Voices of Education (SAVE) provides suicide prevention tools and raises awareness about suicide. SAVE developed SMART: Students Mobilizing Awareness and Reducing Tragedies for high school and college students along with the "Let's Talk About It" community event. The Society for the Prevention of Teen Suicide (SPTS) provides information and resources for parents, teens, and educators. Their educational training, ACT on FACTS, is a free online training for educators. SPTS also produced a 18-minute video, Not My Kid: What Every Parent Should Know About Youth Suicide. Stop a Suicide Today is a program of Screening for Mental Health, Inc. It gives suicide prevention information, including ACT: Acknowledge, Care, and Treatment method of prevention. The Suicide Prevention Resource Center provides resources for suicide prevention including information, training, referrals, news, and events. At Suicide.org, find a suicide hotline in your state. Theravive Therapist Network is a network of licensed and professional clinical counselors, therapists, and psychologists. They provide local, online or phone counselor listings. They also provide workshops, seminars, and events. Matter provides suicide prevention help for students. The Air Force Suicide Prevention Program is dedicated to the well-being of the airmen and their overall physical and psychological health. They provide news and resources for Air Force members along with Suicide Prevention and Resilience Trainings. The US Army Reserves Suicide Prevention Program Manager provides suicide prevention, intervention and post-vention training support to all Unit’s within the northwest region. The US Army Suicide Prevention Program improves readiness of the Army through the development and enhancement of Army Suicide Prevention Program policies, training, data collection and analysis, and strategic communications designed to minimize suicide behavior. Suicide prevention resources for all Coast Guard active duty and reserve personnel and their families are found at this website. The US Department of Veterans Affairs: Rocky Mountain MIRECC for Veteran Suicide Prevention gives information on veteran suicide prevention. The US Marine Corps Forces Resrve: Suicide Prevention gives information on suicide prevention. The US Marine Corps prevention programs help Marines who are thinking about suicide or engaging in suicidal behavior, and those who may be at risk for suicide because of a mental disorder, or because they belong to a group with higher rates of suicide attempts or deaths. Their goal is to develop in all Marines the skills needed to recognize and address suicide warning signs. Their DSTRESS Line is a peer to peer 24/7 phone, chat and Skype line counseling service. US Military Matters provides free programs and trainings in suicide prevention, outreach, and education for National Guard members, Reserves, their families, and mental health providers who provide treatment. The Psychological Health Program advocates, promotes, and guides National Guard members and their families by supporting psychological fitness for operational readiness. They have a service provider finder and a Psychological Health Library. The US Navy has a Suicide Prevention and Operational Stress Control (OSC) Program. They provide resources and information about suicide and support for Sailors and their families. Their Every Sailor, Every Day Campaign is the Navy's core Suicide Prevention and Operational Stress Control campaign to empower behavior change by providing Sailors and families with tips to support themselves and each other. ValueOptions Strategic Principles for Suicide Prevention provides suicide prevention resources for the workplace community. Working Minds: Suicide Prevention in the Workplace provides resources and training tools in the workplace for suicide prevention and postvention along with workplace trainings. The World Health Organization (WHO) provides global information about suicide. The Yellow Ribbon Foundation provides suicide prevention information for teens, parents, and attempt survivors along with a suicide attempt survivors support group list and chapter finder. Your Life Your Voice is the Boys Town National Hotline - a free 24/7 hotline available to kids, teens and young adults experiencing depression, contemplating suicide, being physically or sexually abused, on the run, addicted, threatened by gang violence, fighting with a friend or parent, or facing an overwhelming challenge. Help is accessible by phone call, chat, text or email. Their website also provides resources like their mood journaling app and helpful videos. On the Youth Suicide Warning Signs website you'll find the national consensus around youth suicide warning signs plus information for youth, professionals, and gatekeepers (grandparents, neighbors, teachers, youth pastors, coaches, and mentors). Zero Suicide Initiative is a commitment to suicide prevention in health and behavioral health systems. Zero Suicide provides information and training for senior leaders of health, behavioral healthcare systems, and for advocates. Also find the Zero Suicide Toolkit to begin a Zero Suicide Initiative.